DeLaRue introduces PureImage™, a novel holographic security thread. 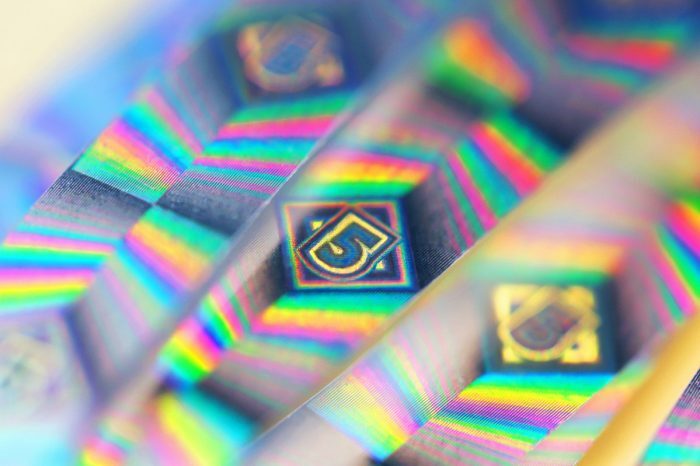 DeLaRue has presented its latest customizable holographic security thread, PureImage™. With an increased demand from the market for higher brightness and new distinguished effects in holographics, PureImage™ thread exceeds expectations with five core bold base effects and bespoke customisation, in addition to passing all industry tests for durability and adversarial analysis. Secure, robust and recognisable, PureImage™ is compatible with pre-print coating and post print varnish and can deliver a Level Two functionality via added machine readability properties and optional UV fluorescence. Available in a variety of widths (up to 6mm), PureImage™ thread is suitable for use on all banknote designs and denominations within a banknote family. It is an extremely bright holographic thread, with clear imagery and bold movements for easy authentication and immediate user verification.